Can we call it an octocore yet? Despite the spotlight still very much remaining on Intel's battery boosting "Haswell" CPU, a fresh leak suggests that the chipmaker may be putting raw power back on the menu before long. Intel could be set to launch its first 8-core CPU for desktops in the second half of next year, beginning with its 2014 Haswell-E enthusiast-grade chip, according to a report on VR-Zone. 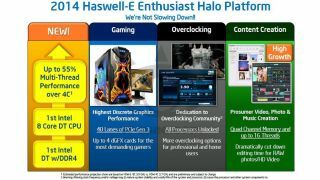 Haswell-E processors will apparently be built on the 22nm 2nd generation Hi-k process and will pack up to 20MB of L3 cache. The chip also looks set to feature Intel Turbo Boost 2, in addition to support for DDR4 and 16 threads thanks to hyper-threading technology, all supported by Intel's forthcoming Wellsburg motherboard chipset. The company is apparently looking to do away with the 4-core base model in favour of 6-core and 8-core versions of the CPU. In terms of raw power, it's the biggest leap since Intel announced its first 6-core processor for desktops back in 2010. The superfast chip could primarily deliver the goods for three types of users: powerhungry gamers, overclockers, and content creators in the video, photo and music fields.